Stop, get up and move. Getting up and walking around is the best exercise you can get to provide a break from sitting, concentrating and using the muscles of the arms and hands. About every 20 to 30 minutes is a guide to how often it is helpful to move around. Even getting up for 20 to 30 seconds to pick up papers from the photocopier or get some water is a way to change your posture and give muscles a chance to recover. Stretching exercises help to relax muscles which have been working and move those which have been in a fixed position. If possible, stand up to do your stretches. While you are exercising, read the notes alongside each instruction and consider whether your workstation is adjusted to suit you. Refer to Section 2 for information on job design. Do a few of these exercises a few times every day. Dots show the muscles that you are exercising. Make sure you relax and perform them gently. Hold the stretch or repeat as indicated on the diagram. Stop if you feel discomfort when performing an action. Remember to do each side. Raise the head to straighten the neck. Tuck the chin in and upwards creating a double chin. This also results in a forward tilt of the head. Repeat several times Fig. B.1. 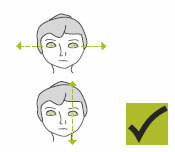 Keeping your chin tucked in, gently lower ear to shoulder and hold for 10 seconds on either side. Repeat several times. See Figure B.2. Turn head slowly to look over left shoulder. Turn head the other way. Repeat several times. See Figure B.3. Position the top of your screen at eye level. Use a document holder directly beside or below the screen – it saves you looking down. Circle shoulders forward several times, then backwards. Repeat 3 to 5 times. See Figure B.4. Relax your shoulders and rest your hands on your lap. 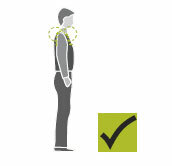 Bend your elbows to no more than 90 degrees and check the height of your finger tips against your current work height. If the work (keyboard or desk) is higher than your hands you may be hunching your shoulders unnecessarily. 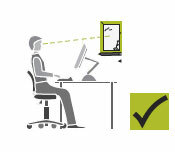 If so, try and raise your chair height or lower your desk height and try and relax your shoulders while working. Interlace fingers, palms outward, and straighten arms in front. Hold for 10 seconds and repeat several times. See Figure B.5. Straighten your arm in front and bend your wrist forward, gently assist the stretch with your other hand. Hold for 10 seconds then stretch your wrist back and hold for 10 seconds. Repeat with other arm. See Figure B.6. While keying, keep your wrist straight while your fingers are suspended over the keyboard. Keep elbows at keyboard level. This may mean adjusting the desk or chair height. Don’t rest your wrists on the desk or keyboard while keying. Keep hands suspended. Rest on the desk between periods of keying. Interlace fingers and turn palms upwards above head; straighten arms then slowly lean slightly from side to side. Repeat movement several times. See Figure B.7. Stand up. Support your lower back with hands and gently arch back and hold for 5 to 10 seconds. Repeat as often as is needed. See Figure B.8. Raise both arms to shoulder height and bend elbows. Pull both elbows back slowly to bring shoulder blades towards each other. Repeat several times. See Figure B.9. Sit well back in your chair – if your feet need support, use a footrest. Adjust the backrest on your chair to support your lower back. Stand up, holding the chair for balance if necessary, and alternately raise heels and toes. Repeat 10 times. See Figure B.10. If the seat of your chair is digging into the backs of your thighs check that it is not too high or whether it is tilted backwards. If the seat is too high, lower the chair and desk or use a foot rest to support your feet. Also check the tilt of the seat and, if necessary, adjust it to a horizontal position. Sit up straight, face forward and repeat this sequence several times without moving your head. Look up, then down. Look left, then right. See Figure B.11. Look up and away from the screen. Focus on a distant object (more than 3 metres away). For example, look out of the window or at a picture on a far wall. Shift vision back to screen and refocus. See Figure B.12. Is there enough light falling on your documents? Do windows or light fittings cause glare or reflection on the screen? If so, try turning the screen or blocking the path of the light. Use a screen with a light background when working with text. Software with a light background for text is more comfortable for the eyes.